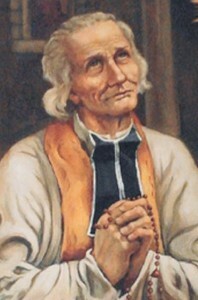 Truly a model of mercy for us in this Year of Mercy, St. John Vianney gave his life to reveal and to minister the mercy of God to as many people as he could. He grew up in France during the French Revolution and saw many priests and Catholics persecuted for their faith —forced into hiding and celebrating the sacraments in secret. John himself received his first Holy Communion in a barn under the cover of darkness. He witnessed priests and laity who denied their faith in the face of this persecution, but he also saw many who remained faithful and risked their lives to bring the faith to others. He saw those priests as heroes who suffered and persevered. Mary, Mother of God and our mother, is truly the model of mercy among the saints to begin our Year of Mercy. As the mother of the Son of God, she participates in and reveals the mercy of God by sharing most intimately in his becoming man in the Incarnation. God’s superabundant mercy is made know to us simply by the fact that he chose to empty himself, to become one of us, to share in our nature. Then, he goes a step further and chooses one of us, a creature, to be his mother. Mary’s fiat opens her up to receive, to participate in, and to share God’s mercy in many more ways – in her visitation to Elizabeth, in the birth of Jesus and the visit of the shepherds and the Magi, in the presentation of the Lord at the temple, at Cana, and most especially at the cross. She proclaims the mercy of God by her life and by her words, as she expresses her joy in praise of God and prophesying the promise extended to us, “His mercy is on those who fear him from generation to generation” (Luke 1:50). Mary’s union with the mercy of God continues through Jesus’ Paschal Mystery, the gift of his very life, in which he reveals and pours out upon us saving mercy beyond anything we could ask or imagine – what love He has shown us, what compassion, what forgiveness! At the foot of the cross, Mary gives us her Son, she suffers, she sacrifices, she loves, and she forgives: “Her sacrifice is a unique sharing in the revelation of mercy, that is, a sharing in the absolute fidelity of God to His own love … that was definitively fulfilled through the cross” (St. John Paul II, Dives in Misericordia, 9). Mary abandons herself to the mercy of God always: “The Mother of the Crucified and Risen One has entered the sanctuary of divine mercy because she participated intimately in the mystery of His love” (Pope Francis, Misericordiae Vultus, 24). Further, she receives and responds to a call to be mother to us all: “Woman, behold your son! …Behold your mother!” (John 19:26-27). 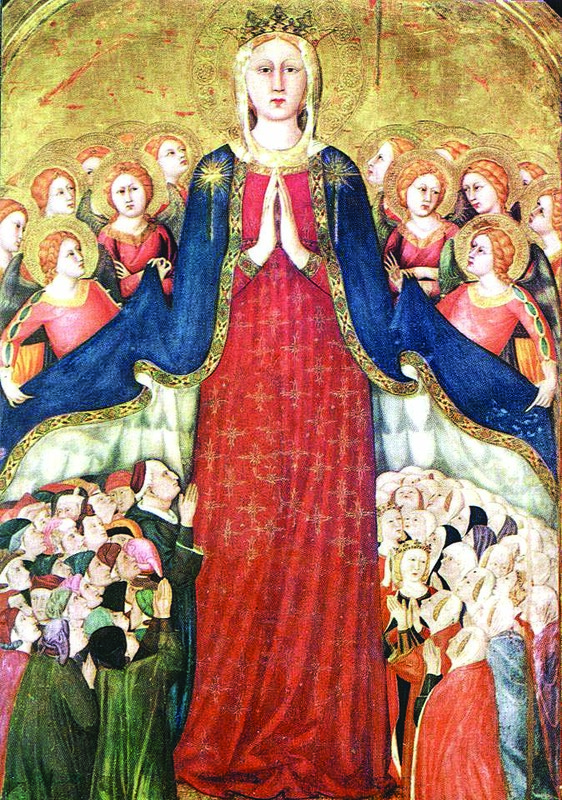 As her children, we turn to our beloved Mother of Mercy: “Let us address her in the words of the Salve Regina, a prayer ever ancient and ever new, so that she may never tire of turning her merciful eyes upon us, and make us worthy to contemplate the face of mercy, her Son Jesus” (Pope Francis, Misericordiae Vultus, 24). 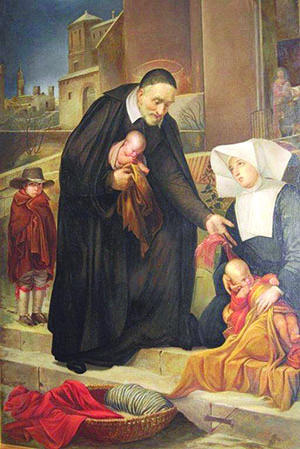 Love and care for the poor marked the lives of both St. Vincent de Paul and St. Louise de Marillac. St. Vincent was born into poverty in sixteenth century France. He responded to a call to the priesthood, but his life took an unexpected turn after his ordination when he was captured by pirates while on a short sea voyage. He was sold into slavery in Africa and for years served a benevolent and aged Muslim who offered to make him his heir if he converted to Islam. Vincent prayed to the Lord and the Virgin Mary for the protection of his own faith. When the old man died, Vincent became the property of the man’s nephew, who sold him to another Muslim, a convert from Christianity. One of this man’s three wives learned about Christianity from Vincent, and, although she did not convert, she reproached her husband for abandoning the faith of his childhood. He repented and went with Vincent to Spain where he was reconciled to the church and joined a religious community. Vincent, now free, returned to France where he once again served the community as a priest. He dedicated himself to both the spiritual and material needs of the people, hearing confessions, preaching and teaching, and serving the sick and the poor. In France, Vincent founded the Congregation of the Mission, more commonly known as the Vincentians, priests and laymen who take vows and devote themselves to their own spiritual sanctification and to bringing sinners to Christ, preaching, teaching, and committing themselves to works of mercy. There he met Louise de Marillac, a woman who also had a great love and faithful commitment to the poor. Louise, as a young woman, had felt a desire to enter religious life, but her spiritual director discouraged her from this path, so instead she married and had a son. After her husband died, Louise, who had always been tireless in her works of mercy, began to join the work of the Vincentians in their apostolate of charity. Together, Vincent and Louise founded the Congregation of Sisters of Charity, a religious community of sisters who give their lives to the service of the poor and the sick. In this great Year of Mercy, these two great saints form a model of fellowship and community given over to charity. Noble Saint Vincent de Paul, beloved servant of the poor, may we follow your example and do good works among those whom society has abandoned, enslaved, or forgotten. Inspire us to feed the hungry, to love a child, to provide comfort and medicine to the sick, to clothe those whose garments are threadbare, and to offer hope and our Lord’s words to all who need respite. Pray for us to our beloved God that we may commit ourselves selflessly to doing the same charitable acts that you did all your life, and intercede with him that we may have the favor of his guidance and strength and love upon this important and meaningful work. Amen. O God, You inspired St. Louise de Marillac with a great love for the poor and abandoned. Grant us the grace to serve those whose lives touch ours with the same spirit of love and courage in these challenging times. May the Company of the Daughters of Charity continue to grow and multiply throughout the world so that the poor will know God’s love in a tangible way. We ask this through Jesus Christ our Lord, who lives and reigns with you and the Holy Spirit, one God forever and ever. Amen. In his encyclical Laudato Si, after stating that human-generated climate change must be urgently addressed, Pope Francis calls all people to conversion, which lies at the heart of his plea on behalf of the environment. Do not conform yourselves to this age but be transformed by the renewal of your mind, that you may discern what is the will of God, what is good and pleasing and perfect (Rom 12:1-2). The denial, continued destruction, and modern distractions which militate against any hope for healing our “common home,” our planet, need to be vigorously challenged. Yet, Christians, as people of hope, trust in the God of salvation, who has promised his presence until space and time end. Firmly grounded in holy hope and in a sacramental view of creation, Catholics are morally obliged to confront still another aspect of the “culture of death” promoted by a society bent on self-annihilation under the guise of individual freedom as it exploits nature and the human beings who depend upon creation for survival. I am the Lord, and there is no other (Is 45:17-18). systems of support for its living organisms; a moral conversion is necessary to “take into account the nature of each being and of its mutual connection in an ordered system” (John Paul II, Encyclical Letter Sollicitudo Rei Socialis, 1987; “everything is closely interrelated” (LS 137). We may well heed the wisdom of our Lakota brothers and sisters in this respect, repeated in so many ways in Laudato Si. Father’s heart, and gazing upon the world through Jesus’ eyes. The Lord’s vision derives from a change of heart which focuses on an ecological view environmentally, economically, socially, culturally, and humanly integral, since each influences the others. 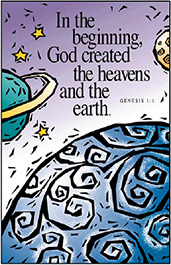 It may be no accident that “Care for God’s Creation” is last of the seven general themes of Catholic Social Teaching. Without this theme, acting as a capstone, promoting a healthy natural environment, the life and dignity of human beings, especially of the poor, and their participation in family, community, work, and solidarity in building a just and peaceful global society would surely suffer if not be impossible to realize. Christian care speaks to the dignity of the human person, created in the image of a compassionate and caring God, who wills fulfillment for his works. Pope Francis describes as a fallacy the “technocratic paradigm” to solve all problems, including climate change. If the world’s people do not understand the death-dealing in present economic and social structures, and begin to adopt an alternative vision for human activity, there is little science can accomplish. Again, such a revolution must begin with repentance and conversion of heart. Catholics are in a privileged place in this regard given the church’s long-standing social justice tradition, which acts as a scaffold not only to protect the environment but to renew it. As Lent approaches, it may well be spiritually beneficial to reflect prayerfully on Laudato Si, easily downloaded online, and to petition for compassion of heart, enlightenment of mind, and courage to care for our common home, through which the world receives the loving nurture of a generous God. In this Year of Mercy, what actions are necessary to envision and to understand our place in the garden God has created? What is required of those who are to live the Beatitudes? the early rain also covers it with blessings (Ps 84:6-7). Send forth your Spirit and let us be created, and renew the face of the earth. Father Seminara is the Associate Director of the Ministry Formation Program. He resides at Sioux Spiritual Center, Howes. In last month’s West River Catholic, I began to share with you information about the envisioning process and where we were in regard to the completion and implementation of our Priority Plan. This month, I would like to begin sharing some detailed information about the Priority Plan for the diocese of Rapid City. When the plan document is printed and disseminated among the faithful, you will notice that we began by clarifying who makes up the Diocese of Rapid City. It is important to understand that the “diocese” is more than the 80 parishes and missions in western South Dakota. 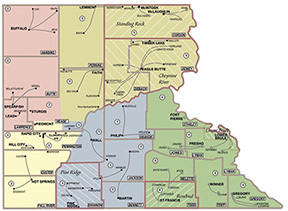 The diocese includes a territory – the land west of the Missouri River in South Dakota – but more importantly it includes all people in western South Dakota. The bishop’s flock includes all the people of God, both Catholics and non-Catholics alike. The mission of the Diocese of Rapid City must be aligned with the mission of the Roman Catholic Church which comes from the mission of Jesus Christ — the mission of the Gospel. In other words, the alignment of the mission of the diocese flows from the mission of Jesus Christ himself. Because the diocese is the bridge between the “Universal Church” and the “local Church,” our sacred mission is meant to build up the body of Christ. In doing so, we can engage in a mutually shared vision as disciples of Jesus. We recall that Jesus’ mission and vision is to call his disciples into the very life of God. Our sacred mission statement provides the framework within which every ministry of the diocese focuses their work in order to fulfill the objectives of our mission. The purpose and mission of every parish and diocesan entity should also stem from the mission as outlined in the diocesan mission statement. The Priority Plan clearly defines the focus of the diocese over the course of the next 3-5 years. Our values also come into play in determining how we interact, communicate and behave in carrying out this sacred mission. The Envisioning Team has identified a set of core values, selected from many worthy options, which are named, defined and illustrated in the Priority Plan. These values are so important that they should be exemplified in every person, every family, every ministry and every organization all across the diocese. Prayer — Seeking an encounter with God in Christ through the Holy Spirit, according to one’s own culture. Stewardship — Living a life of generous hospitality, lively faith and dedicated discipleship. Solidarity — Recognizing and accepting all people as brothers and sisters in Christ; being responsible for the common good of all. Charity — Loving God and others because God has first loved us. Family — The domestic church, the foundation of society, a communion of persons called to reflect the life of the Trinity. The team also outlined many behaviors which exemplify these values. They will be shared at a later date when the whole Priority Plan is communicated. Our vision is one which offers a message of hope and opportunity that draws the people of God to something greater than themselves and inspires them to action. The ideas and thoughts that were gathered from the listening sessions held throughout the diocese last summer were instrumental in creating the vision and priorities. Our vision statement for the Diocese of Rapid City is: Reconcile – Make Disciples – Live the Mission. Vision statements are meant to be short so that they are easy to commit to memory. In being committed to memory, they become an underlying mental picture of what will be important for us over the course of the next five years. This vision statement — Reconcile — Make Disciples — Live the Mission — leads to the Pastoral Priorities for the Diocese of Rapid City in the coming years. The three Pastoral Priorities and the goals which accompany them will be finalized in the near future and communicated in the March West River Catholic. In the meantime, I encourage each of you to become familiar with our vision statement and in prayer, begin to ask the Holy Spirit how you might be called to engage this vision in a personal way, as well as in your parish community. Ask the Holy Spirit to prepare your heart to live this inspiring vision and pray for the fruitfulness of this important mission. As we continue to introduce the full Priority Plan, I am very hopeful that we will create a healthy, vibrant diocese for years to come — building the kingdom of God. May God continue to abundantly bless you, your family and the Diocese of Rapid City. The Diocese of Rapid City includes South Dakota land from the Missouri River west to the Wyoming border. Recent statistics remind us that we need to be more inviting communities of faith. The pastoral essay, “Becoming an Inviting Church,” published by Paulist Evangelization Ministries, describes a “new normal” for Catholics. Weekly Mass attendance rates have dropped below 25 percent. They argue that “once a month” has become the new normal or the new “once a week” for most parishes. The great challenge for us as individuals and as parish communities is to begin making new connections with those in our parishes who are absent from Sunday Eucharist. Making connections is all about relationships. As brothers and sisters in Christ, we are called to be in communion and relationship with one another; this is part of the divine plan of the Father. This comment caught me off guard and, after hearing it, the story of Cain and Abel in Genesis 4:8-9 was placed in my heart. Recall that Cain said to his brother Abel, “Let us go out in the field.” When they were in the field, Cain attacked Abel and killed him. God does expect us to be our brothers’ and sisters’ keepers. It’s all about relationship! The heart of our new ministry of sending lay witness speakers three times a year to every parish is to emphasize how the Lord Jesus Christ is alive and active in each of our lives. involved in the faith life of a parish community where we experience Christ’s love through our involvement renews and strengthens us. We have a lot of work to do. Hopefully, our lay witness speakers will foster and develop this connectedness to the body of Christ through their own testimony and witness. I have a challenge, or, if you will, a homework assignment, for you this week as a way to start making connections with people in your parish communities that are registered members of the parish but who are, for the most part, missing and absent from Sunday Eucharist. When you go to Mass this weekend, make it your personal intention for the Mass to ask the Lord Jesus, through the power of the Holy Spirit, to place in your heart one person who you no longer see or rarely see at Mass. If the Holy Spirit places in your heart a name, I invite you to contact that person this week and reconnect with them. Simply tell them that their name came to your mind and heart this week and you just want to reconnect with them. Call them, email them, text them, write them a note, or take them out for a cup of coffee. Then report back to me next week. Fr. Mark McCormick 605-716-5214, x235 or MMcCormick @diorc.org.